"Alborough's simplicity results in another gem." Bobo needs a hug. But his friends don't seem to understand. "Hug," he implores, time and again. Time and again his puzzled pals—from the smallest chameleon to the tallest giraffe—shrug and cuddle with their jungle mothers. As the lonely chimp's plea escalates, his friends grow concerned. Can the elephants lead Bobo to his heart's desire? Jez Alborough, the acclaimed author-illustrator of WHERE'S MY TEDDY?, IT'S THE BEAR!, and MY FRIEND BEAR transforms a total of three words—and some of the most tenderly expressive animals ever created—into an endearing tribute to love and belonging. 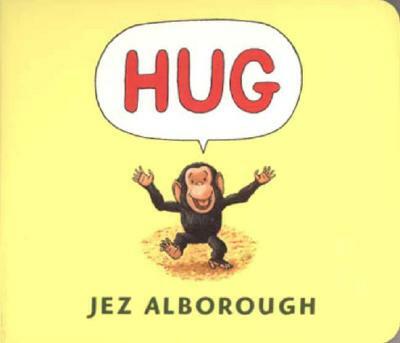 Jez Alborough says, "Bobo and his mommy just had to be chimps—they've got the best arms for giving hugs!" Like a wordless book, the story unfolds through a series of expressive pictures. . . .Alborough makes clear . . . the elation the animals gain from their shared affection. From the warm golden cover to the animal grins at the end, Alborough's simplicity results in another gem.